I went looking for something to replace my ageing A4 paper shredder - and found this little beauty. It’s a tiny machine 18.5cm wide x 14cm deep x 24cm tall - yet capable of shredding 4 sheets of A4 (folded lengthways), along with staples (although I usually rip those out myself), or credit cards. As suggested by the privacy folks due to the risk of identity-theft - I wanted one that does cross-cut - which means it cuts both into strips and then cuts the strips again - so it makes it harder to reassemble your personal information. This doesn’t cut into the smallest pieces possible, but I think it’s fine for domestic work. 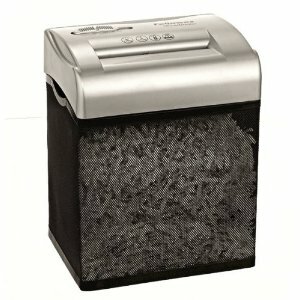 I only use it for shredding personal info (any junk mail I get with my name & address on - credit card applications and the like), and the occasional printed document I bring home from work that I don’t want to drop into the recycling container; so I wouldn’t class myself as a heavy user - so for me it’s fine.